I had originally planned to buy some white knee high socks and wear them under my dress, but after deciding that I was going to have a good stab at make a late 18th century wardrobe I added stockings to my list. Prior to this I had never sewn with stretch fabric, and I wasn't looking forward to it. The fabric sensed my fear, and this project turned out to be one of those that fights you every step of the way. I started researching last year, looking up extant examples and reproductions. I loved the colours and embroidery on the clocks, much more interesting than a modern white sock. MFA. Pair of clocked stockings. European. c.1650-1750. MFA. Pair of Clocked Stockings. French. c.1790-1800. MFA. Pair of Clocked Stockings. European. c.1750-1800. 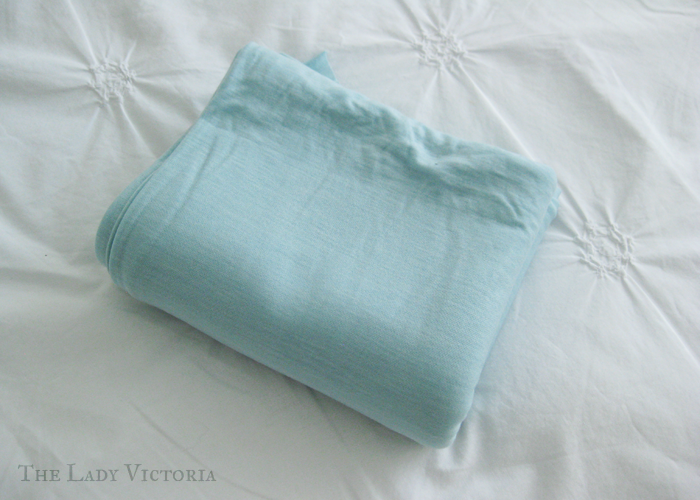 I bought some fabric off Trademe (New Zealand's version of Ebay) that was described simply as a 'soft cotton knit fabric'. It was only NZ$5 for three metres so I took a chance and bought it. 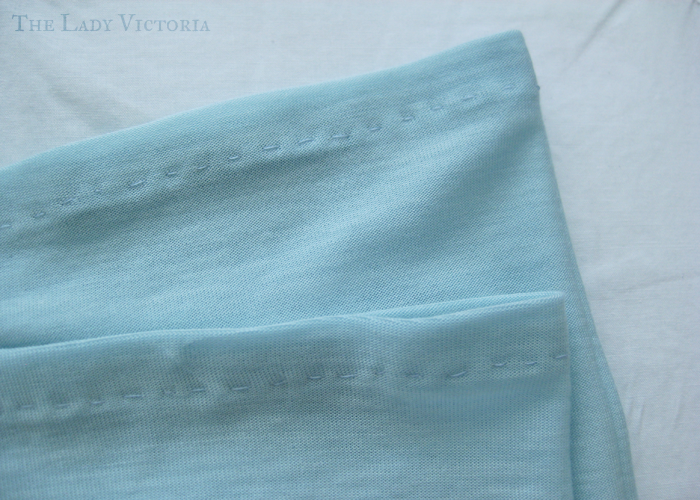 The picture on the auction showed a nice white fabric, but when I got it, it was pale blue! It was certainly knit, and certainly nice and soft, but not white. 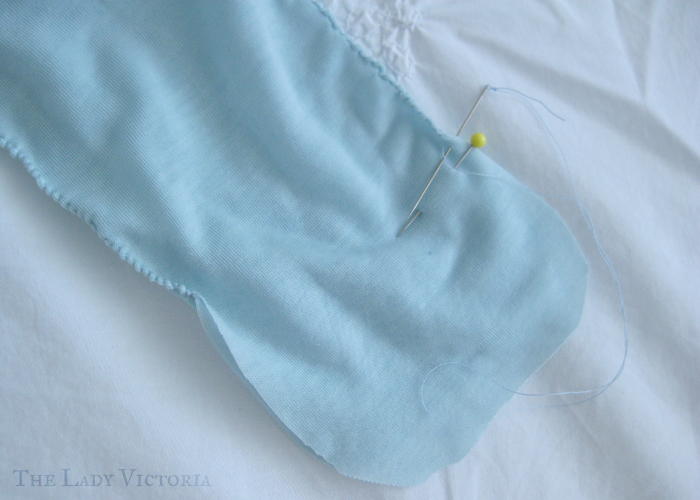 I decided to make a pair of blue stockings as practice, then bleach the remaining fabric to make one or two white pairs. I searched around for a pattern to use. I loved Before the Automobile's Late 18th Century Stockings, which were self drafted. La Couturière Parisienne's article on 18th Century Stockings had instructions to self draft a pattern, but the most thorough explanation of self drafting I found were Rebecca Manthey's instructions. Although aimed at serious New England re-enactors, there is a wealth of detail and research in her instructions, and they're easy to follow. I made up a pattern for the long gore stocking. This was before I had a real grasp on what part of the 18th century I wanted to focus on, and these stockings aren't really suited to my 1780's wardrobe, being popular up to the 1740's. 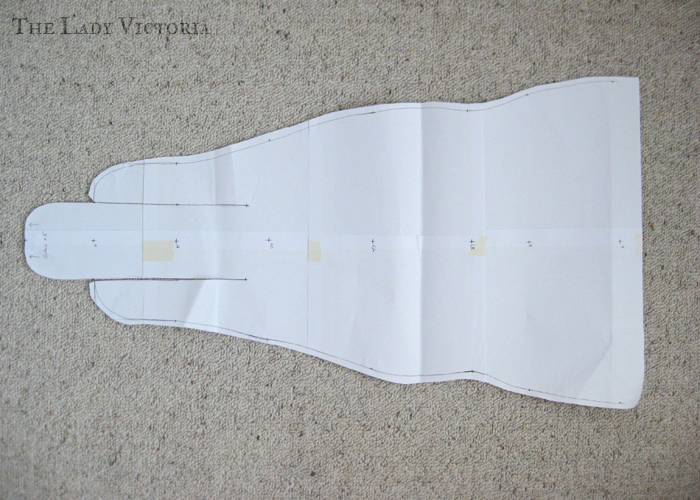 I cut out the fabric and started to make a mockup of a single stocking, to check the fit. Unfortunately I don't have any pictures of this process, but you can be assured it was a painful one. I whipstitched the edges together by hand, a slow process that I wasn't very good at. I worried needlessly about the stitches preventing the stockings from stretching, and if I was using the right techniques for stretch fabric. When I finally finished my mockup, there were problems. A few measurements had gone wrong somewhere, and there wasn't enough fabric to even cover my toes! I'm not sure if this is an issue with the instructions, or my bad maths skills. You can see on the pattern above where i've drawn arrows to indicate another inch or so needs to be added to the toe area. My whipstitching was also far too loose, and didn't look nice at all when it was stretched. I practiced whipstitching with the knit on a few scraps, making sure to have tight, close stitches. 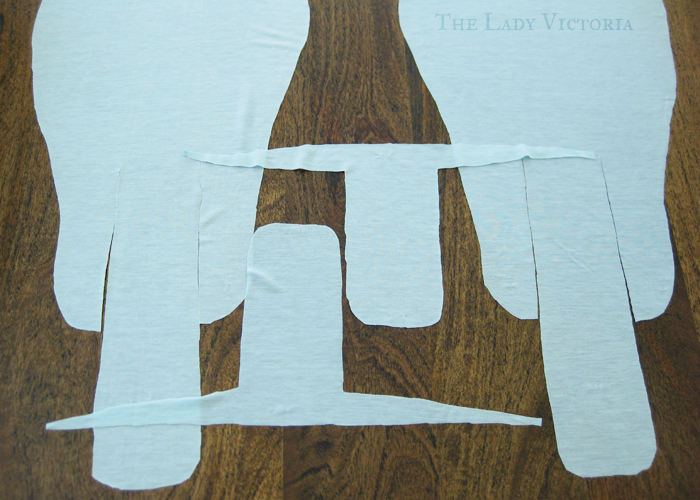 Then I cut out the pieces for my proper pair of stockings. I took extra care with the slippery, stretchy fabric, and managed to get some neat pattern pieces for the blue fabric, and left enough fabric to bleach. As you can see, the long gore stockings are not good for fabric conservation and don't make for easy cutting. My original idea was to do some nice embroidery along the gores. Nothing on the same scale as the extant examples, but something small to decorate the gores with. I whipstitched the gores into place, leaving the rest of the stocking open for easier embroidering. After documenting and unpicking my failure I left the unfinished stockings in my stash for a few weeks. I came back to them with a much simpler idea. Looking closely at Before the Automobile's stockings, I saw that she had stem stitched the edges of the gores with white embroidery to hide the seam. I decided to do that in a contrasting colour, and then add a small monogram. The stem stitches were great at adding some extra stability to the gores; you can see here how they stop the seams from rolling. 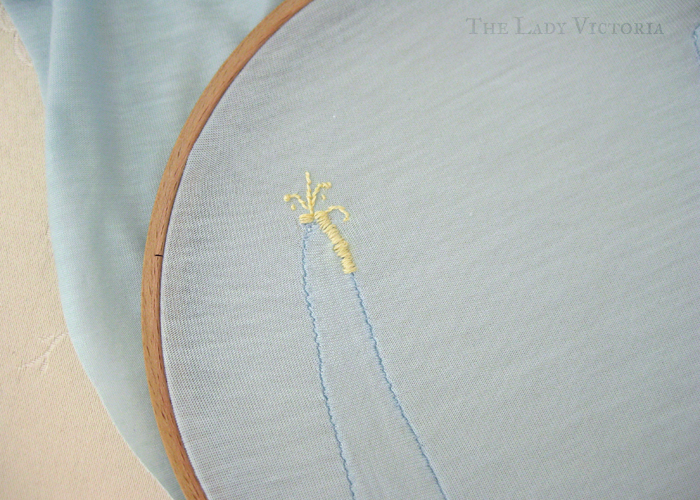 The monogram was also done in stem stitch, with some simple swirls on either side. I loved the rose and yellow coloured extant example from the MFA, so I chose a pale yellow to contrast with the blue. The pink of the swirls completes the pastel look. 18th century stockings could be extremely gaudy, so mine are very tame in comparison. A stem stitched gore and a small monogram worked out much better than my original attempt, and I was starting to feel more confident working with the knit. After finishing all the embroidery, I whipstitched the back seam. I had deliberately made the toes two or three inches longer than I needed, to avoid them turning out too short. 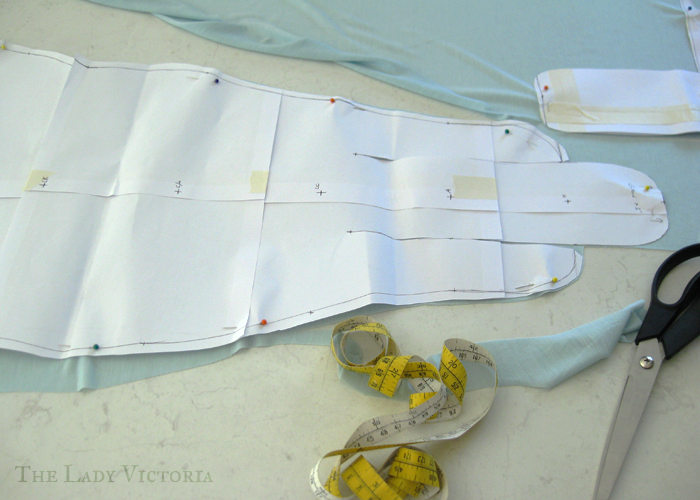 After the back seam was done I tried the stocking on, and measured where my toes came up to. I cut off the excess fabric on a diagonal, to better fit the shape of my feet. I then whipstitched them closed. I wasn't quite sure what to do with the top of the stockings. Costume in Detail by Nancy Bradford has one example with the top edge left raw, and another with a hem. 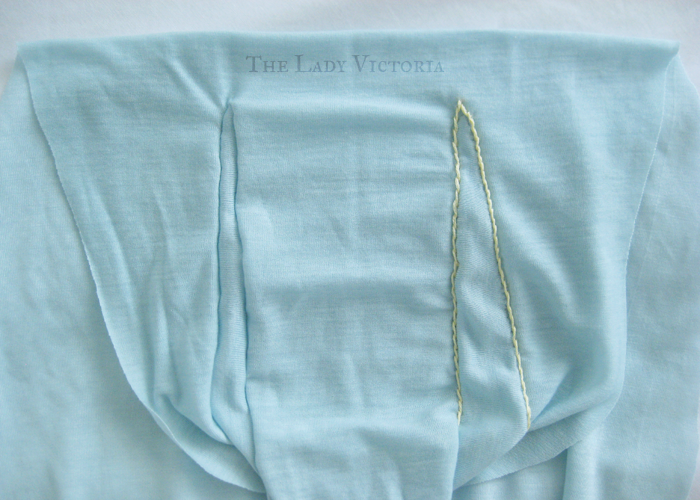 In the end I decided to fold the top edge over twice, then secure it with a running stitch. These stockings were a nightmare to make. From research to completion they took me about eight months! For most of that time they sat in my cupboard after some disaster happened when I tried to work on them. I so happy they're finished now, and all the mistakes just means the next pair will be easier. I hope. Would love to see a photo of you wearing the stockings after all of that work. I'm determined to make me a pair. Thanks for sharing! 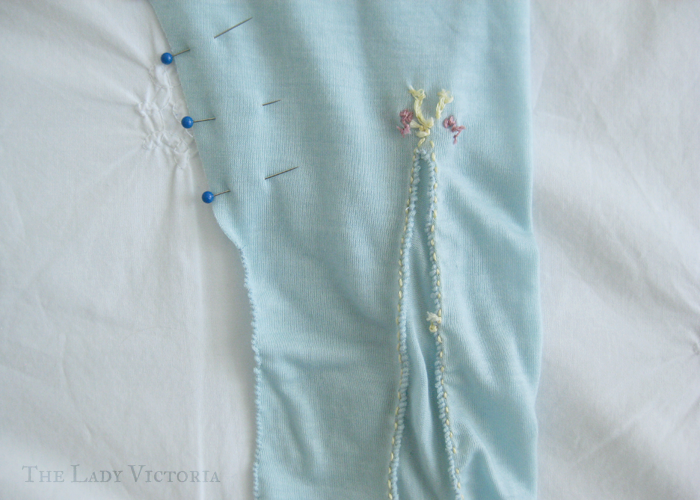 Hello, loved this post about constructing the stockings! I've been to many museums to research their stocking collections and I've seen many originals. You asked in a later post about angling the toes — I haven't seen that done on any historically. Something you did realize is that the clocking is done on both sides of the stocking, so there is no left and right. With a custom made item, though, people today will do a lot for fit and comfort that might not have been done back then. A big challenge is using cut and sewn knit fabric to mimic an item that was knit to shape on a machine. Cut & sewn was done, though. In the late 18th century, there were some fancy specialty fabrics that were knit horizontally but worn vertically on the leg. In the early 19th, technological advances made it cheaper to knit plain fabric used to make stockings called "cut-ups." These were very poor quality, cheap stockings that did not last (I don't think there are any extant) and probably not what you are going for with your elegant stockings. The effect of cut-ups on the economy was what brought in the Luddism of 1812. So, here are some thoughts that might help for future stockings. The tops: as you know, they were "hemmed" or left plain. The plain tops have the cast-on edge, so they are not a cut edge. To make the hem, they would knit about an inch and a half of the fabric, then loop the cast-on edge back into the work and keep knitting. For hand stitching your repros, I would suggest a whipstitch rather than a running stitch, because a whipstitch will be more flexible. Since (good) stockings were knit to shape, all the edges would be firm. Think about a hand-knit scarf, the yarn is continuously going back and forth. 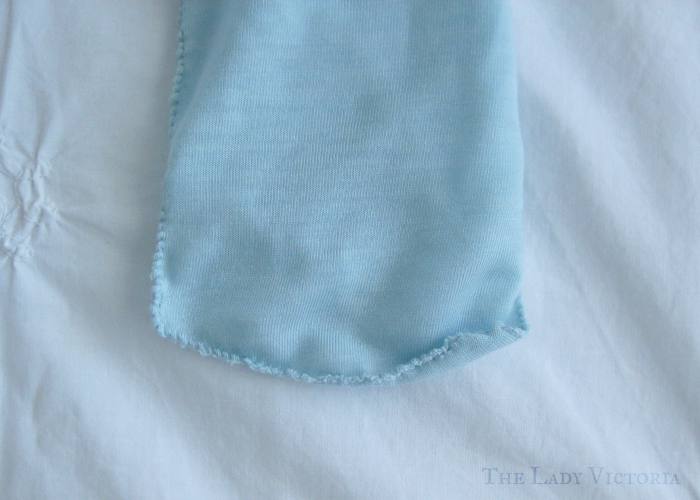 They needed very little seam allowance, just the width of one stitch. 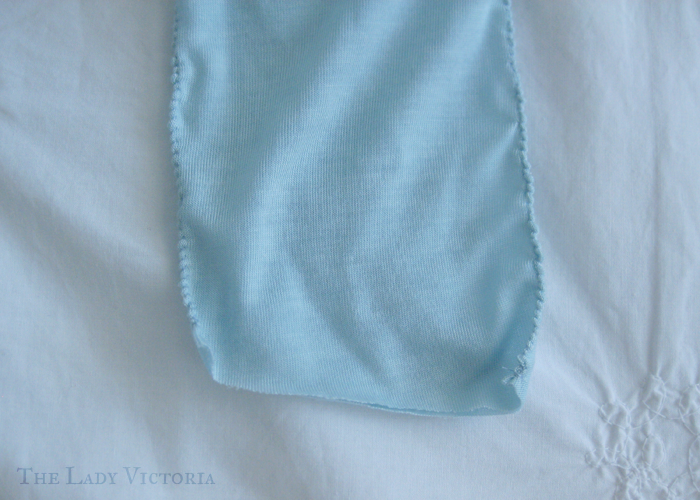 The seams were a chain stitch, possibly done with a hook. I have seen whip stitching as a repair occasionally on some originals. On the ends of the knit (under heels and ends of toes), the join looks like more of a bind-off. So your construction is a challenge because it's different from what they were doing. Wow! Thank you so much for all the wonderful information in both of your comments! It's interesting to hear about the toes not being angled, it's something that's hard to tell from museum photos. Getting to see extants up close and research them sounds fascinating. I know that I probably did loads of things wrong when I was making my own versions, but it's nice to hear that I wasn't too far off the mark! Knitting and knit fabric is something I know very little about, so I probably could have chosen a better fabric to start with. It was quite slippery and not at all firm, so chain-stitching the seams might have been a challenge. On one pair of fancy knit cut & sewn stockings, there is shaping that cleverly uses the seam allowance. There is about 1/4" on most of the leg, but where it narrows under the calf it becomes an inch. 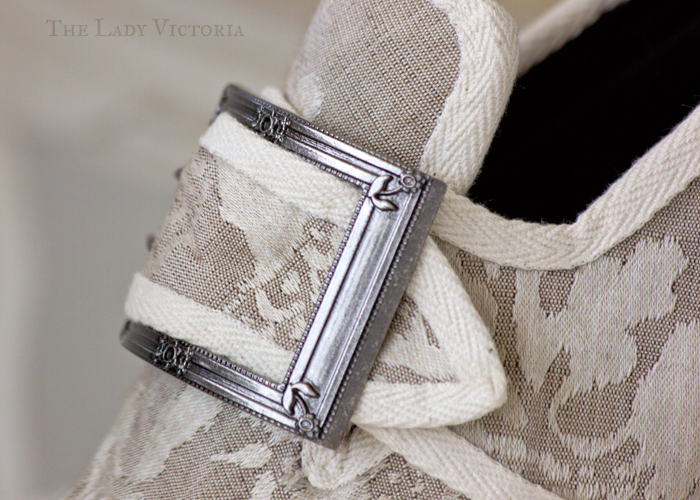 This extra fabric means a double thickness in the heel, making a reinforcement, which I thought was pretty cool. For your long gore pattern, it's just a little bit off. The back edge of the gore is straight, not angled. On the lower front of the gore where it becomes the bottom of the foot, there should be a little bit of a curve there rather than a sharp angle. As an angle it will be a stress point. You mention that the cut is not good for fabric conservation, and we know that 18th century construction in general was pretty good about not wasting fabric. 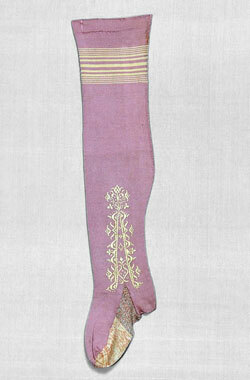 These long gores were not cut from knit fabric, though, they were knit onto the stocking to shape. The framework knitter would knit the leg, including the three lobes for the foot and heels (all with finished edges). The heel edges would then be pressed onto the frame and the gore & sole would be made, then the sides of the feet stitched up. The next thing isn't an "always" but it is a "mostly": Long gore construction was used when they had a different color for the gore. 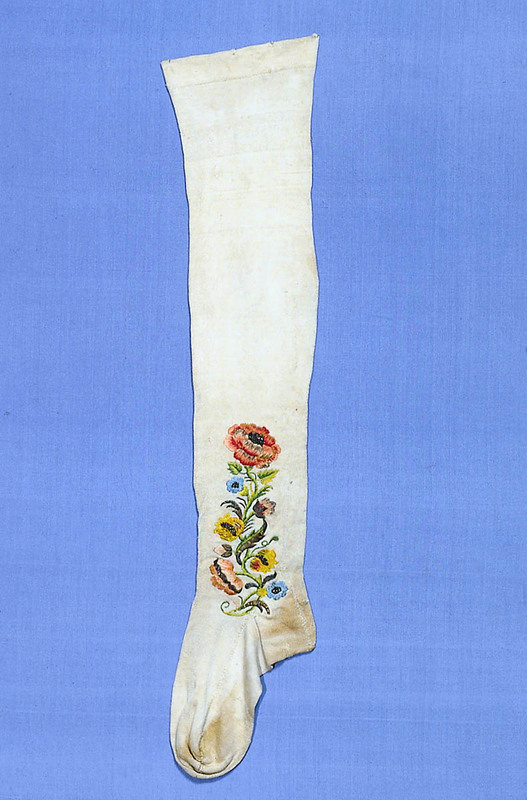 Embroidery and knit stitch variations could be used to suggest a long gore in single-color stockings. 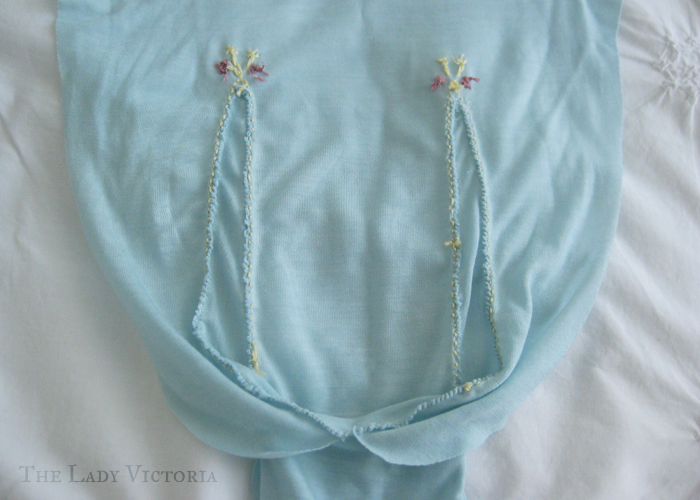 The lavender stocking you show above has no gore at all and a sole of scrap yarn, with the inverted "V" embroidered. Kannik's Korner has a stocking pattern with a shorter gore. For a design at the top of the gore, crowns and snowflake/flowers are the most popular, together or separate. Mara Riley has them charted in the center image at the bottom of the page: http://www.marariley.net/knitting/stocking.htm Early in the century, they would have been done on the frame. A second color of fibers was laid overtop the main yarn, called "plating." 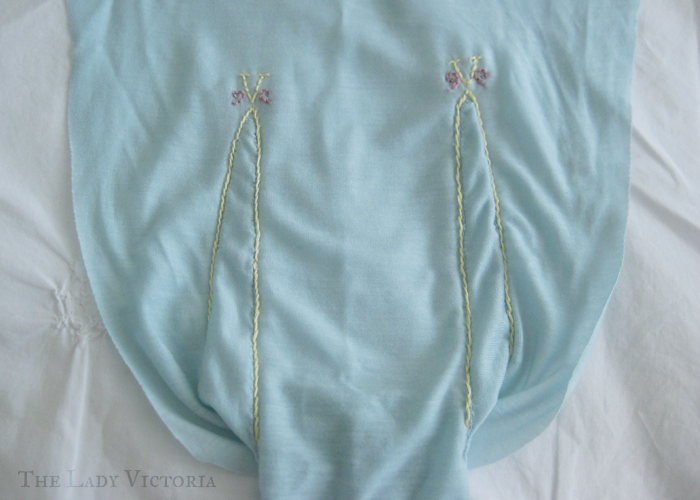 Later in the 18thC they would just take a horizontal stitch across one, three, or five knit stitches, called chevening. A needlewoman claims to have invented chevening in 1783. 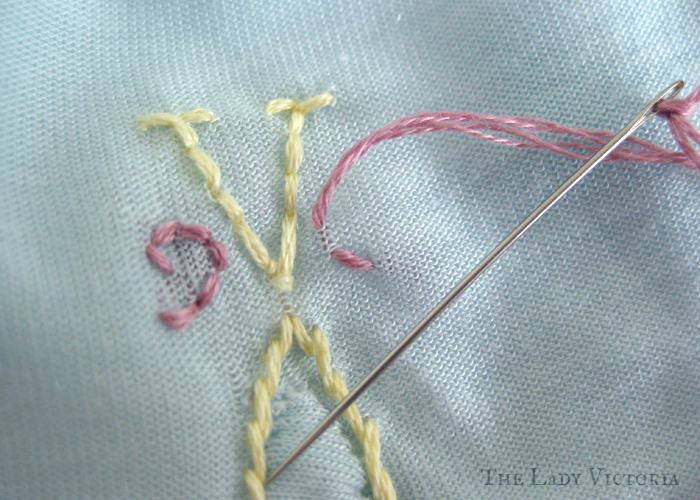 Initials tend to be done in a marking stitch near the top of the stocking. I see it on plainer stockings, probably so they could get everyone's stockings back to the right person after laundering them together.